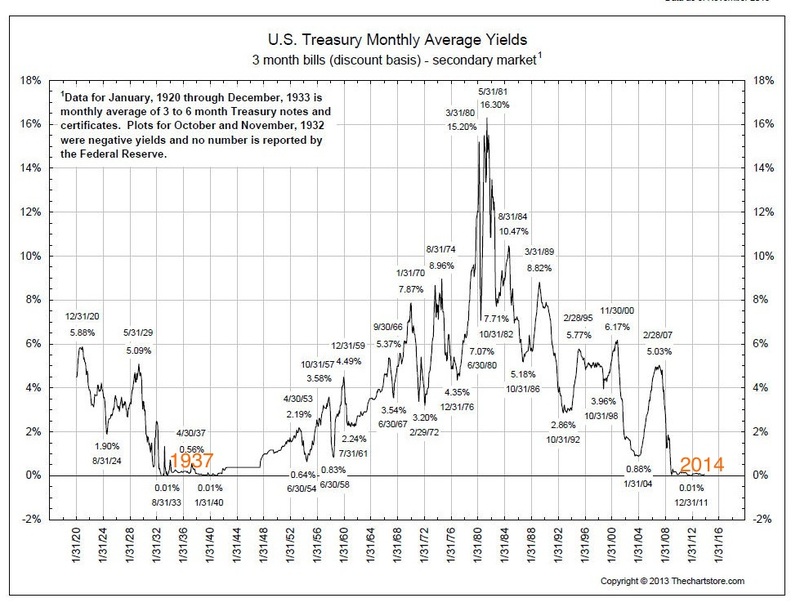 1937 was a solar maximum, like 2014, and notably the stock market peaked out despite negligible interest rates and with preceding QE, i.e. it was an atypical bull market end: easy conditions, no over-tightening. Stocks were run up on relatively thin volume and low participation to a Q-ratio valuation of over 1, in a 5 year rally. Stocks topped out 1 month away from the smoothed solar maximum without any notable trigger event. They had front-run a significant pick up in earnings and the economy that failed to materialise, and later in 1937 the US economy slipped into recession. 2014: we have had a 5 year rally since 2009, set against ZIRP and QE. Stocks have been run up on low participation to a Q ratio valuation of over 1, front-running a return to ‘normal’ earnings and economic growth that demographics suggest will remain elusive. In 1937 the thin volume allowed the market to rise easier, but then also to fall easier, and we have the same low volume now. Speculation should peak out close to the smoothed solar maximum, which looks most likely to have been around February. Unless the sun get busier yet, then we might expect stocks to be topping out. Evidence from sentiment, euphoria, divergences, leverage and asset allocations suggest this is indeed likely. The weak economy and exuberant stock market are at risk of a deflationary shock, but failing that, realisation that 10% earnings growth and over 3% GDP growth are not going to happen again is bubbling under the surface. In other words, some surprise bad news could provide the requisite dent in confidence in equities, or stocks could roll over without a strong GDP print for Q2 (release 30th July) or an impressive Q2 earnings season (reporting starts 8th July). 1937 provides an example of stocks topping out on overvaluation despite easy money conditions. Other historic examples of equities front-running to over-valuation were also resolved by a bear market. Timing the top in 1937 came down to pinpointing the peak in the sun’s activity, and I believe this is the same challenge in 2014. Interestingly a 40% decline in the Composite from last weeks high if it were to match the second half of 1937 decline would take the Comp back to the region of the 2011 lows. John, correct me f I am wrong but I do believe that in a previous essay you did suggest that ultimate targets for the DOW and SPX on a waterfall decline would likely be a test of the 2011 lows.? Since beginning of the year, u have been shorting the market. When the index goes higher, do you hold more position? Yes I have been growing my overall short positions, whilst also taking some short term trades on the short side. How did the solarcycle correlate with markets that experienced hyperinflation? Demographics are deflationary right now. Hence disinflation and tumbling money velocity, despite QE and ZIRP. Plenty of stocks that are cheap. Please enlighten us which ones. Also in 1937, the advance-decline breadth measure peaked coincidentally with stocks. John, I suspect that 1937 is more like 2011, and the actual solar max related crash came later. However, due to WWII tensions, we did not make a new high. The same happened in WWI, where the crash seem to have come early because of a failure to make a new high. Something I read a long time ago intrigued me about 1937. The actual thinking and feeling at the time was bullish as many thought the market could not go down. Why?, the DOW had a 6% yield. On that basis, we are even more incredibly overvalued than even us chastened bears think. The 2007 and 1980 top did this to me. Kept rising even as many bearish signals had been given. If the top from 2000 to the 2009 was an ABC 4, then we are in a final 5th wave up that could go for years. That also fits with the 60 year Master Time Factor that says now is like the 1950’s. I still go with this is a megaphone top Reverse Pt Wave, but it is certainly wearing me out. I like what you showed about 1937, but we have to admit it is very rare. In it’s favor is all the big boys have total faith in the credit cycle and the FED put. Plus they totally discounted the 1% drop in first quarter GDP. If the US economy is really faltering now, watch out below. Another interesting aspect of the 1937 comparison. The rise from the 1932 bottom around 40 to 196 was a clear major 1 up of an Elliott. The fall from 196 to around 100 in 1938 was a clear 2. So even if 2009 was a 1932 style bottom, and the market is long term bullish, a 50% or more 2 retracement is entirely possible. John, like your ’37 comparison. Have been looking at this and assuming Dec 31/13 was the true top with current index position as 2nd chance then June 10th is the time equivalent to the completion of the ’37 top formation. The other timing window I follow is the 2011 precious metals top formation and you alluded to it in a previous post. Gold topped on 8/20 with silver on 4/23. Assuming Biotech/Social media internet which topped Feb 25 is like higher octane silver with the board indices acting more like gold than the time equivalent for a top in the board indices is June 25. In summary the ’37 and the 2011 solar tops would indicate a good chance of speculative mania peaking in a window between 10-25 June based on those two comparisons. Just my 2c. Thank you for all your valuable contributions. Sit back snd relax folks. All is well, the stock market reaches another all time high yet again. Forget the fact that Publc and Corporate debt have exploded in just about every country in the OECD since 2007. You wanna know whois buying?……look no futher than companies themselves. Afterall, what else are they going to do with the massive amounts of cashthey sit on, raised not from record cash flows, but from record bond issues. One wonders what hapens when the buying spree ends but let’s not rain on the parade just now. Just think how much richer our retirement funds are, if we get to cash it in before it evapourates that is. Baby Boomers are THE most irresponsible generation in history. John, the depth and breadth of your research from all the various sources you cite never ceases to amaze me. I think that most of fundamental analysts and those who love to compare todays DJIA or S&P to the past, miss the crucial aspect : today, the markets are global, more global than before. I wouldn’t care if U.S stocks are overvalued if other economies are depressed, if U.S. is safer than elsewhere, if money is confiscated or just risk is greater outside the U.S. I wouldn’t, if I were trading fundamentals. I trade the price and it tells me it’s going up. The price even may surprise Nadeem Walayat’s last forecast, to the upside. I think that shorting this market is a MISTAKE. I’ve been telling this since December so I guess I am boring. Ah yes, the old, “trade the price because this market is different to any other market that has been before” argument. Allan, if you prefer to make money shorting this market, that’s your choice. I don’t bet against any market, even if that’s 5m wave I don’t fade it just because it looks overbought or oversold. My rules come form my experience not from reading too much. And I’ve been trading the price only for a long time, I gave up the fundamantals many years ago. another interesting observation is the Biotech index making a lower high having retraced 62% of the down move which looks complete. This is equivalent to silver’s retracement high around 45 when Gold crested in 2011. John, I thought your target for the Dow Jones was lower than 2009 bottom-upward and downward wedge- Is a misinterpretation of mine? I have 3 targets, as I published in this web and the 1st one is around the 2011 lows, +- 200Monthly MA. apanalis, I think you will find that is his very long term target around 2023? Yes ultimately. This first target is for the waterfall declines, then after that I expect a significant retrace. Janet, you are beautiful…don’t be too angry with poor bears. If someone is wrong again and again about the market and doesn’t learn from his/her mistakes, this means that the person doesn’t want to, doesn’t have to, this is their choice not to make money. If Allan loves more his analysis than money, fine. I a journalist is payed for writing B.S. about markets, that’s also fine. If someone has deep pockets and doesn’t have to be right – O.K. Some people commit acts of self-sabotage and don’t even know they don’t want to make money for some reason. But I have to pay my bills and I will never be employed again, therefore I have to be right most often than not. Brilliance doesn’t matter, style doesn’t matter, time online doesn’t matter. If it’s only 1:0 everyday, this is what I need. If I limit myself to just one scalp a day – I will be fine. despe, not sure exactly what you are going on about? I made a conscious several months ago that this market was likely in the exhaustion phase and no longer justified putting long money at risk. I believe we are in topping territory. If you so choose to risk money by being long from time to time, so be it, but don’t come here and tell those of us that are bearish that we are “dumb”, yes whilst you have not said it exactly that way you are impkying it, beacuse we refuse to buy what we perceive as an unsustainable market. You may play price as much as you wish, however at every major top in the last 30+ years I have heard the same rhetoric regarding ignoring fundamentals because we now live in a different era. I have haeerd all the justifications as to why Fed stimulus means stocks will never decline markedly until they end ZIRP and POMO. I’ve been around too long to buy the hype. Same show, different cast. Below is just ONE of the reasons why I refuse to go long this market. Spanish bonds now at 200 year lows!!! Absolute insanity! I said it once before, markets no longer act as markets should. ALL risk has been driven out and is now about non-existant, driven out despite the fact that risk IS just about as high as it has ever been. Due to unprecedented Central Bank intervention markets are now distorted beyond all reality. If you can’t or don’t want to see that, fine, no skin off my nose. However, mark my words, the day is coming when anyone with a long position will find it nigh impossible to cover at anywhere near their stop price. I expect that given the advent of HFT we are going to see 1k point drops on the DOW over consecutive days. Remember, for every seller there must be a buyer, there is though, NO guarantee as to what price, especially when everyone is running for the exits. The easy low risk money to be made in this market has been and gone and yet to look around you would think completely the reverse is true. God luck. You are going to need it. I always thought that HFT is eliminating trendiness instead of generating it, especially on small time frame. Mike Shedlock is a LOSER, he’s been a bearish deflationista since 2009, I am not sure if he turned bullish at all just for one day. If you pay attention to his words, he will lead you to the slaughter. No offence, but I never implyied that bears are dumb. I just said that for various reasons traders/investors prefer to be right rather than to make money or they don’t want to make money for other more or less scientific reasons, and I am not talking about lack of intelligence or sanity. I have been long enough not to buy the scare hype. The risk is enormous, buy with confidence. different time frames. You trade on daily and intraday charts, John trades the weekly or monthly. John has said that a final top may not come in until late summer or fall. Just an observation i have made that has not been noted anywhere else that i can tell. Apple split today is garnering a great deal of attention. I was around on March 23, 2000 when a similar event occurred with Cisco Systems. You can talk about PE ratios and how dominant Apple is and everything else. But that was the 2000 top for the stock market. Remember, history does not repeat itself, but it does rhyme. People are learning from the past to move on. This is how civilization works. But ….forgive me. Are you serious that is what you have learned after fourteen years? if you are concerned about my investments you will be happy to know that i was heavily short 2001-2002, 100% gold stocks 2002-2011, and have been steadily selling stocks for the past year so that i am 30% stocks, 40% long treasuries, and 30% cash. there are many more interesting posts here that you can bug the authors of. Specie, I’m sorry if my words made you feel bad. As you can tell, I’m not a native English speaker, and I just took a chance to practice writing in English. So, please don’t take them so seriously. By the way, I extremely respect your records. Thanks for sharing. Another eloquently written article John. 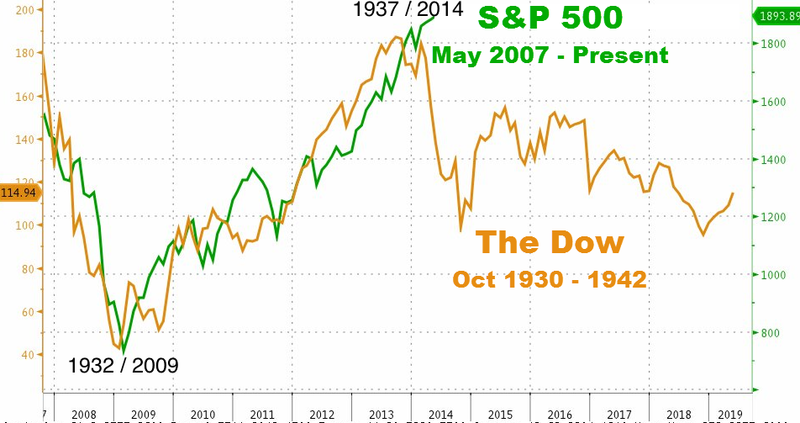 Love your analysis of 1927 vs. 2014 trend. While volume left much to be desired, the expectation of stronger and more active markets continued to pervade Wall Street. Moreover, the general business picture is regarded as more pleasing than at any time since the so-called Summer “lull” came into force. Incidentally, the seasonal letdown thus far has not proved to be as extensive as many predicted and expected. Brokers saythat many clients are away and that there are others who will be replacing their sold-out long positions in coming weeks. Interesting Chart du Jour on this URL showing we’re in the ‘mania’ category as of 6 June. PEGASUS, the true top cant have been dec 2013 co sthe markets are now higher! Robbie, I refer to Dec 31 as orthodox top which can be lower than subsequent price action. Long Bond yield and USD/Yen which are both negatively correlated with stocks having peaked around then as well would confirm such a top in my view. Six C-class solar flares today; three from sunspot 2085 which is still facing us. It is showing a 20% chance of M and 16% of X-class flares. And another increasingly active region will rotate into view Tuesday. Talk about timing – Terry Wogan would be proud of that. Gentlemen, something relaxing to ease the tension here. There is an interesting correlation between your fortune and your wife in Chinese astrology. An alternative indicator to see if you can survive the coming storm. There are basically two types of serious married male investors involved in financial markets. Type A: Independent, Confident, and Aggressive (the real boss at home). Type B: the opposite of Type A; (your wife is the real boss at home). For type A gentleman, the happier your wife is, the better your investment will be. Take Buffett for example, the peak of her ex-wife’s career was correlated to his booming career. Not to mention how an ancient king pleased his wives with his massive fortune. For Type B gentleman, the more supports you get, the better you will be in financial adversity. Turn to your friends, parents, or your seniors. Ignore (but respect) your wife’s suggestions. As a type A male, this year, I have hired one more servant to help my wife with her “chores,” and planned 2 more shopping trips abroad for her. Believe me, this is mostly for my good. From video, mini-max cycles are prone to large cme eruptions. If a major cme erupts towards earth and knocks down electrical grid, you could be trapped in panic selling/buying mania once systems sporadically, come back online, since all trading is electronic. Maybe cash is best until definitive direction is observed? The buy the dip guys are still very strong as shown today. We need a major negative event to initiate the sell off. Until then it’s a slow grind up with occasional melt ups when central banks stimulate further. These posts are so fun to read in the morning… You make my days gentlemen. John’s “second Chance” idea is most delicious today. I just took an aggressive position in shorting the Biotech which paused at its 61.8% retracement level. The stop is easily identified. I already have a nice Biotech short position, but I saw the same, Newt, and was telling a couple friends it would make a nice entry point. Good call on your part. Today, for the first time ever, I fell asleep during the session. Then I watched some video clips, browsed a bit and found Kathy Lien blog ‘how to trade in low volatility environment’ LOL. My two sense is Bears/Bulls should watch weekly IWM cloud baseline at 113.93. If this is bearish, as I suspect, we should snap it and not look back. If we don’t bearish scenario in near term troubles IMHO. Any situation can be interpreted bullishly or bearishly. A Goldman economist (Jan Hatsius) just said the economy is finally taking off and will be growing above trend. I just saw that credit growth had taken off and broken out of the plateau it had been in for the last 8 years. The Debt Bubble is Back by John Rubino on themarketoracle.co.uk. gold has broken above its 200 ma since the top in 2011. The rally in gold from the 1982 bottom was another massive false buy signal. Dean Witter had a proprietary technical system called COMPARE. It had an medium term buy signal based on the momentumof the 1950 to 1965 markets. It was great until the late 60’s when buy signals were sell signals. That type reversal is either happening now or we bears or dead wrong. I have to wonder whether those who continually post that the bull market will never end and that all bears will be crushed are real people, voicing their own opinions, or paid shills. I favor the latter. Why would they bother to continue posting on this site if they disagree so vehemently with the current opinion of the guy who runs it? Doesn’t make much sense, unless they’re being paid to do so. John’s analysis is excellent, and his patience will be rewarded. Calling a stock market top precisely to the day is next to impossible. If you want to short the market, you’d better be willing to have a negative carry for some period of time. It’s all about having patience and conviction. Definitely, D.J. Never saw those shills that frequently here prior to the propagation of the “bull market will never end” meme, maybe this is an indicator of some kind too. Negative divergence that had emerged in early April is getting completely erased. Normally this would be seen as mega bullsih except that it is on ever diminishing volume. The last time I remember this sort of action was late 99/00. It is remarkable how stocks turned on a dime back April just as they were about to takeout critical support levels across all major indces. I do remember at the time on consecutive afternoons at roughly the same time each day, buyers appearing out of nowhere on zero news. Very very suspect. They were also not broad market rallies at the time, very selective buying to get the most bang for their buck. One wonders how much longer they can keep it going? I suspect not much longer at all.